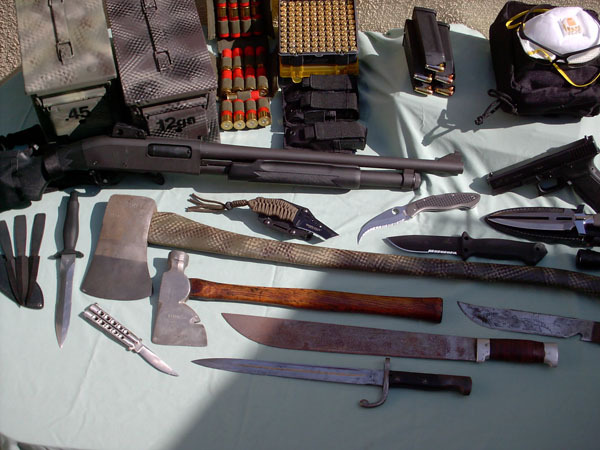 I would like to use the axes and longer bladed weapons first to keep some distance between me and those trying to eat me, but the smaller knives are durable and very sharp for close quarters contact. I am in the process of making a leather scabbard for the Craftsman ax to affix to the side of my bug out bag. It adds some weight, but it is very versatile as both a weapon and tool. This piece has been in my family for several generations. It is very worn, but still in great shape and very sharp.